Hillary Clinton refuses to make public the transcripts of her speeches to big banks, three of which were worth a total of $675,000 to Goldman Sachs. She says she would release the transcripts "if everybody does it, and that includes Republicans." After all, she complained, "Why is there one standard for me, and not for everybody else?" As the New York Times editorial board pointed out, "The only different standard here is the one Mrs. Clinton set for herself, by personally earning $11 million in 2014 and the first quarter of 2015 for 51 speeches to banks and other groups and industries." 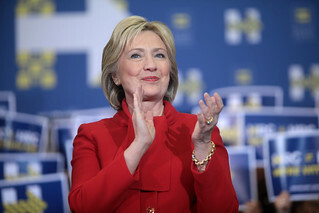 Hillary is not running in the primaries against Republicans, who, the Times noted, "make no bones about their commitment to Wall Street deregulation and tax cuts for the wealthiest Americans." She is running against Bernie Sanders, "a decades-long critic of Wall Street excess who is hardly a hot ticket on the industry speaking circuit," according to the Times. Why do voters need to know what Hillary told the banks? Because it was Wall Street that was responsible for the 2008 recession, making life worse for most Americans. We need to know what, if anything, she promised these behemoths. Hillary has several super PACs, which have recently donated $25 million to her campaign, $15 million of which came from Wall Street. Big banks and large contributors don't give their money away for nothing. They expect that their interests will be well served by those to whom they donate. Hillary recently attended an expensive fundraiser at Franklin Square Capital, a hedge fund that gives big bucks to the fracking industry. Two weeks later, Hillary's campaign announced her continuing support for the production of natural gas, which comes from fracking. Bernie opposes fracking. He said, "Just as I believe you can't take on Wall Street while taking their money, I don't believe you can take on climate change effectively while taking money from those who would profit off the destruction of the planet." Bernie has no super PACs. His campaign has received four million individual contributions, that average $27 each. Perhaps Rupert Murdoch multiplied that amount by $100 in setting $2,700 a head as the entrance fee for Hillary's latest campaign gala? Bernie has called for a "political revolution" that "takes on the fossil fuel billionaires, accelerates our transition to clean energy, and finally puts people before the profits of polluters." He would retrain workers in the fossil fuel industries for clean energy jobs. Bernie reminds us that the top one-tenth of 1% owns nearly as much wealth as the bottom 90%, and 99% of all new income goes to the top 1%. Unlike Hillary, he says healthcare is a right -- not a privilege -- and college and university tuition should be free. Bernie and Congressman John Conyers introduced legislation to allocate $5.5 billion to states and communities to create employment programs for African-American youth. They say, "instead of putting military style equipment into police departments ... we [should] start investing in jobs for the young people there who desperately need them." How will we pay for all that? "If we cut military spending and corporate welfare, we would have more than enough money to meet America's needs," Bernie wrote in his 1997 book, Outsider in the House. "This nation currently spends $260 billion a year on defense, even though the Cold War is over," not counting "$30 billion spent annually on intelligence or the $20 billion in defense-related expenditures hidden away in our federal spending on energy," he added. Today, with all the wars our government is prosecuting, that figure is nearly $600 billion. With Bernie Sanders, we have a unique opportunity to reverse long-standing priorities that favor the few at the expense of the many. Let us seize the time.